The Open Heart International Team have all returned back to Australia, and this is my last post on our adventures. Allow me to share a little story of my own. Myanmar people are honest. The video camera I inadvertantely left under the bed back in Ngapali Beach was found by cleaners. The cleaners handed it on to the desk operators at the resort. I was handed a phone in the airport passenger lounge telling me I had left my camera behind. The resort is a good half hour drive from the airport. The resort management put the camera on the other competition airline at no cost and it was picked up by a doctor lieutenant. The video camera was waiting in my room in Yangon before I arrived. Well how honest and organised is that? In another country the chances of getting that camera back would have been minimal. This is the case in point, I find the people of Myanmar to be respectful, honest, easy going, and have a sense of humour. 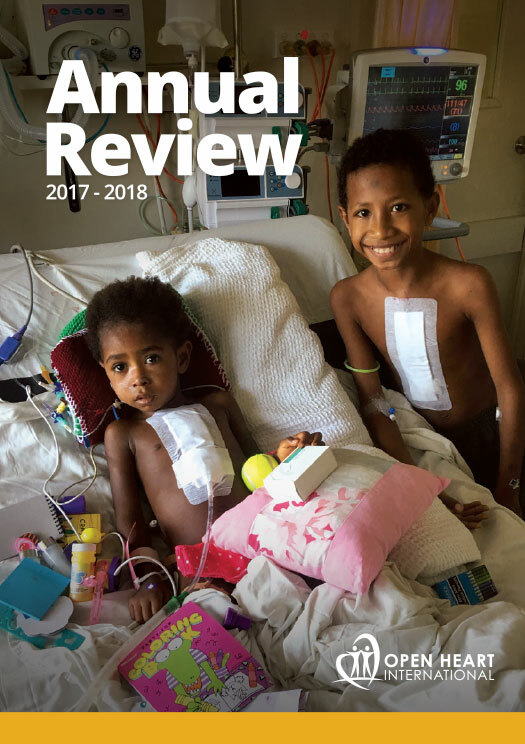 It is therefore understandable, why it is so compelling for many Australians in the Open Heart International team to return year after year. They sincerely want to help, and of course the great camaraderie between all the team members. 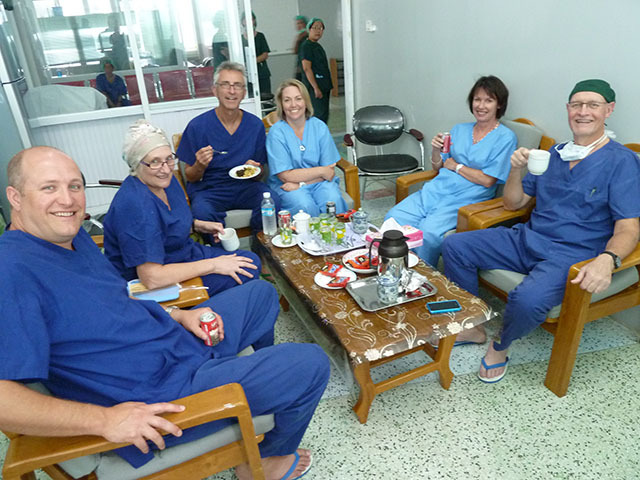 It was a great pleasure to be able to be a part of all the different parts of the team over the three hospitals in Yangon, to get to know everyone and share a meal or two (Why am I the only one eating and was the only one that hadn’t done anything all morning? I was starving! On a friendly side note for some of the team, there is an important point to the photo on the right. Ian Moore looks happy and relaxed here, but by the next morning he was moaning with a serious fever! To make things worse, many of us had written him off with a rare Malaria-Typhoid Syndrome. That’s what can happen when you keep the company of doctors and nurses I guess. He’s fine now by the way. Finally, on behalf of our Leader Chris Waite and also myself, we would sincerely like to thank our team members, donors, medical companies, travel agents and everyone that made this visit possible. The list is phenominal. Without the teams commitment we could not achieve the educational outcomes that we each strive for. The generous donations made by our medical sponsors enable the less fortunate to have access to free healthcare. We acknowledge and thank you! P.S. This is not Chris and I, rather two monkeys from the Yangon Zoo during a very brief stop there when we had a couple of moments spare. Best Regards To You And Your Families. 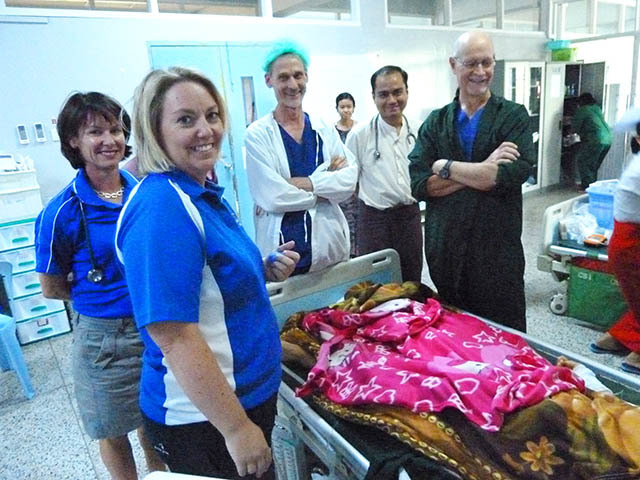 From Warwick Creeper and the Operation Open Heart Team – Myanmar.